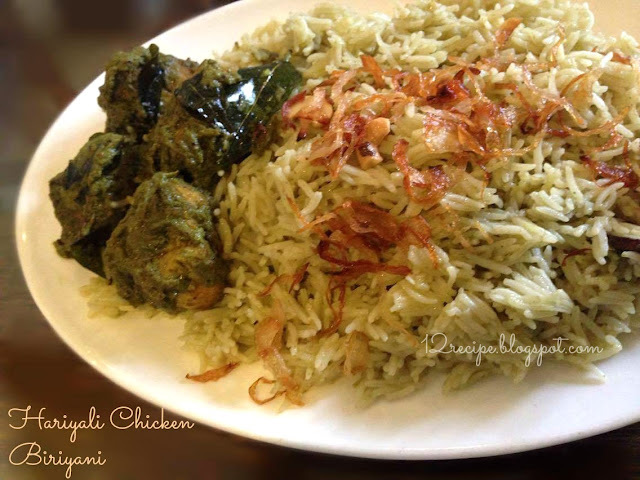 Hariyali Biriyani means a Biriyani with greenish touch!!! Here i'm not using much spice powders but green leaves replace it. It tastes very different and delicious. Give a try and serve with your family. Wash and soak the basmati rice in water for 30 minutes; Drain it completely. Add drained rice and saute for 5 minutes until the rice become stiff but not changes its color. (stir carefully without breaking the rice). Add 4 cups of boiling water, enough salt and one spring of curry leaves. In a blender add lemon juice, mint, coriander and remaining one spring curry leaves; make a smooth paste out of it (if necessary add little water). Add the green paste in to the cooking rice and mix well. Cover the lid of rice pan and cooks until all the water gets absorbed and the rice get cooked nicely. Marinate the chicken pieces with salt, vinegar and half of pepper powder for half an hour. Heat oil in a pan, saute onions well until nicely browned. Add ginger garlic crushed; saute for a minute. Add the marinated chicken pieces in to it and mix well. Blend mint leaves, coriander leaves, Curry Leaves, green chilly and curd together to a paste. Add it in to the chicken masala; mix well. Add enough salt, remaining pepper powder and garam masala powder. 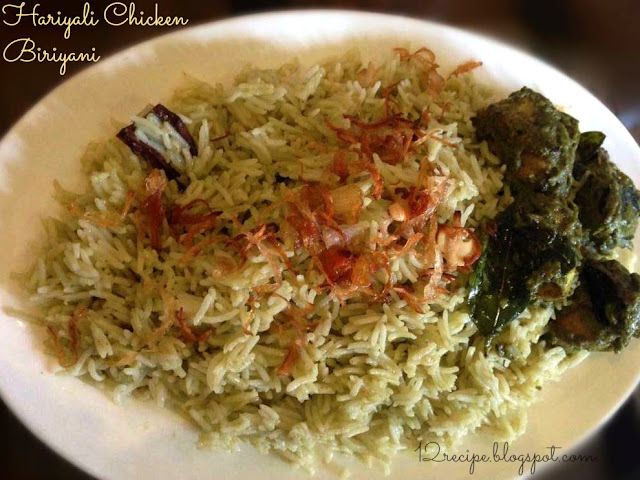 Cover cooks the chicken for about 20 minutes or until nicely cooked and well coated with the thick green masala. Now serve this hariyali chicken masala on side with above cooked rice and garnish on top with fried onions and curry leaves. (if you wish to do the dum process, U can also go for that).